I’m not going to make you wait until the end of this review to give you my opinion: this album is off the chain! Now remember, I am not an expert on discerning levels of sound quality, or at picking out nuances in the way music is mixed, but I do know how to enjoy a great show, and there is not a single track on this two-album set that disappoints. While some critics (and concert goers) have been known to whine and fuss about The Cars not being a ‘dynamic’ live act, no one can deny that when it came to the music, this band could recreate their remarkable studio sound flawlessly from the stage. Because of this, many fans have lamented that The Cars never released a live album during their active years together. Sure, there are a handful of bootleg recordings that make their way around the Fanorama, but not a complete live show remastered and released by the band, itself… until this year, that is! On April 22, 2017, Rhino Records put out a limited run of 5,000 copies of one of The Cars’ early live performances as part of the worldwide vinyl movement, Record Store Day. 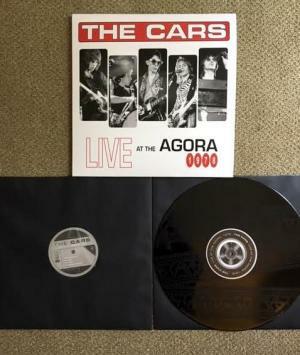 The Cars Live At The Agora, 1978 documents the energy and the fresh sound of the band at the beginning of their rise to success. Just to give you some context, The Cars consists of songwriter Ric Ocasek on rhythm guitar, and he trades lead vocals with long-time friend and bandmate Benjamin Orr, the bass player. Elliot Easton handles the lead guitar, while Greg Hawkes works his keyboards and David Robinson keeps everybody locked in with his drums. This five-man lineup started playing together in early 1977, and within 18 months they had a record contract in their pockets and their first album on music store shelves. With their debut single, “Just What I Needed,” gaining popularity on the airwaves, the band took off on their first major tour, spanning the United States, and including stops in Canada and parts of Europe. The Agora show here, recorded at the Agora Ballroom in Cleveland on July 18, 1978, for WMMS radio (about a month into their tour), is a shining example of the band’s ability to interlock their individual roles to create a tight, rollicking performance that keeps the listener bouncing from song to song. No, not a bunch of jumping around and physical gyrations, no long monologues or extended soloing by band members, no pyrotechnics; just an ensemble of creative and classy musicians doing what they do best: rocking the house. The set list for the night is an interesting blend, giving the enthusiastic audience a taste of where these boys have been and where they are going. Not only are there excellent performances of all nine incredible songs from their debut album, but The Cars also burn through some raging rockers from their regular club set (the hard-edged “Take What You Want” and the powerful punk of “Hotel Queenie”) and treat the crowd to “Night Spots,” which will show up on The Cars’ future album, Candy-O. They end the concert with a gritty cover of Eddie Cochran’s “Something Else,” letting Elliot take over the lead vocal on their last song of the night. Other audio delights pour from the speakers. Listen for Greg’s crazy-cool assortment of eclectic sounds on “I’m In Touch With Your World,” and then catch him later as he pushes the show in a whole new direction with his melodic saxophone (“All Mixed Up” and “Something Else”). Also, I love how you can really hear the power of David’s drums on “You’re All I’ve Got Tonight,” and how Elliot kills it on that classic guitar solo in “Just What I Needed.” My favorite tracks feature Benjamin pouring his all into the vocals, like on “Bye Bye Love” and “All Mixed Up;” you can just feel his racing pulse as he belts it out. And woven throughout the entire show are great harmonies, some highlighted backing vocals, and brief audience interactions that draw a smile. The cherry on top? Rhino Records really nails it with the packaging of this release. The signature red-and-black color scheme of the early Cars’ years, combined with the terrific photos of each band member and the reproduced hand-written show notes displayed on the backside of the album cover – it’s definitely a stare-worthy addition to the vinyl stack. 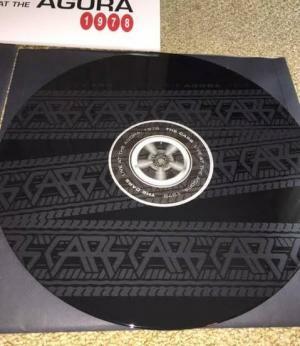 Inside the cover are tucked two records; three of the sides contain the music, and the fourth displays what would prove to be the first in a series of custom etchings to grace the 2017 releases of Cars albums. Awesome! The vinyl is hard to get ahold of now, though there are still a few copies available floating around online (mostly from Europe). At this time there are no plans for the show to be released on CD; fortunately Rhino has now made it available digitally through several music channels. Click below to download the album. If you don’t have it already, get a copy – it’s a must-have for every Cars fan!